Let's see how blockchain works behind the frontend web-application. 1. The DISCIPLINA alpha network consists of four witnesses that confirm transactions and issue new blocks of the DISCIPLINA alpha blockchain. 2. The central witness in the diagram is isolated from the outside world to keep building the public chain even if public witnesses are down under DDOS. 3. Nginx is set up as a proxy before APIs served by Witnesses and Faucet to provide HTTPS for clients. 4. 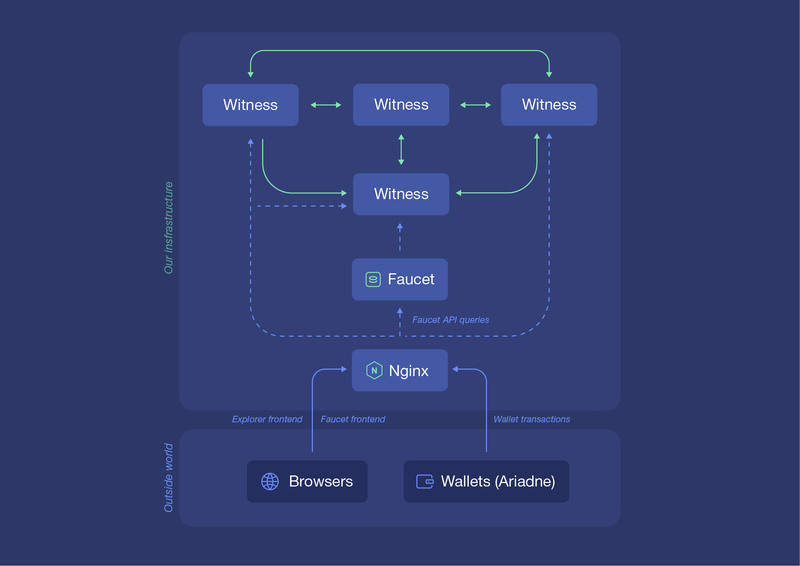 Nginx also distributes queries for block explorer API (explorer.disciplina.io) among three witnesses which serve it.